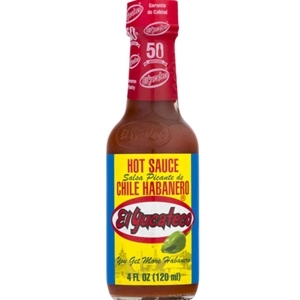 El Yucateco Chile Habanero Red Hot Sauce is a great sauce from El Yucateco of Mexico. Their salsa picante roja, or "red hot sauce", is a fine "true" Mexican hot sauce. It's elaborated with their classic recipe, based on habanero peppers, red tomatoes and a selection of fine spices and seasonings. Its unique consistency and fiery flavor will satisfy even the strictest palate. It is ideal to go with any kind of seafood. Savor a shrimp cocktail with a few drops of this delicious hot sauce or prepare a traditional Bloody Mary with a twist, a spicy Michelada or a Sangrita with Tequila. 4oz. Water, habanero pepper, tomato, salt, spices, acetic ac., xanthan gum, citric ac., sodium benzoate as a preservative, FD&C red No. 40 and calcium disodium EDTA.